Using transfected fibroblasts expressing both wild-type I-Ek and green fluorescent protein-tagged I-Ek with covalently attached antigenic peptide, we have monitored movement of specific MHC:peptide complexes during CD4+ T cell-APC interactions by live-cell video microscopy. Ag recognition occurs within 30 s of T cell-APC contact, as shown by a sharp increase in cytoplasmic calcium ion concentration. Within 1 min, small MHC:peptide clusters form in the contact zone that coalesce into an immunological synapse over 3–20 min. When T cells conjugated to APC move across the APC surface, they appear to drag the synapse with them. This system was used to examine the role of costimulation in the formation of the immunological synapse. Blocking CD80/CD28 or ICAM-1/LFA-1 interactions alters synapse morphology and reduces the area and density of accumulated complexes. These reductions correlate with reduced T cell proliferation, while CD69 and CD25 expression and TCR down-modulation remain unaffected. Thus, costimulation is essential for normal mature immunological synapse formation. Groundbreaking microscopy from Kupfer and colleagues (1, 2, 3, 4) has shown that a variety of molecules accumulate at the interface between an Ag-specific T cell and an APC. These accumulated molecules are spatially segregated into distinct structures termed supramolecular activation complexes (SMACs)3 (4). The central region (c-SMAC) contains TCR/MHC:peptide complexes, CD80/CD28, PKC θ, Lck, Fyn, LAT, and Vav (4, 5, 6). Surrounding the c-SMAC is a peripheral ring (p-SMAC) containing ICAM-1/LFA-1, talin, and CD2/CD48 (4, 5). An elegant live-cell imaging study by Grakoui et al. (7), using fluorescently labeled proteins suspended in a planar lipid bilayer in place of APC, described the molecular rearrangements leading to the formation of this ordered structure, also called an immunological synapse (8). Immune synapse formation requires T cell cytoskeletal rearrangements (9, 10), and this process takes several minutes after the initiation of intracellular signaling (Ref. 7 and this report). Although the exact function of the immunological synapse is unknown, it has been proposed that the immunological synapse stabilizes engaged TCR and accessory molecules, allowing for a sustained signal sufficient to fully activate the T cell (5, 7, 11, 12). T cell activation requires more than just an antigenic signal through the TCR. Secondary molecular interactions (costimulatory signals) are also required for full T cell activation. The prototype of costimulation involves B7 molecules (CD80 and CD86) on APC and their receptor on T cells, CD28. Numerous studies have shown that B7/CD28 ligation enhances proliferation and IL-2 secretion by CD4+ T cells (13, 14). CD28 engagement is linked to cytoskeletal rearrangements upon TCR ligation (5, 15), and cytochalasin D blockade of these rearrangements abolishes the CD28-mediated enhancement of IL-2 production (16). In addition, CD28 engagement induces the accumulation of membrane microdomains (rafts) (17), which are thought to be critical for T cell activation (18, 19). B7/CD28 interactions synergize with another costimulatory pair, ICAM-1/LFA-1 (20, 21) to provide optimal costimulation for CD4+ T cells (22). As with B7/CD28, ICAM-1/LFA-1 interactions have been linked to cytoskeletal rearrangements within T cells (23). Cytoskeletal rearrangements are of prime importance in formation of the immunological synapse (9), and costimulation participates in controlling these rearrangements; nevertheless, the potential role of costimulation in immunological synapse formation remains controversial. Arguing against a role for costimulation in immunological synapse formation, Dustin and colleagues (7, 24) have observed that inclusion of CD80 in their planar lipid bilayer had no effect on synapse formation. The efficiency of conjugate formation during the interaction of CD28-deficient T cells with APC in vitro is not altered (25), and CD28-deficient T cells display TCR polarization to APC in vivo (26). In contrast, Wülfing and Davis (9) found that Abs to CD80 and CD86 or ICAM-1 inhibited TCR-induced, polarized movement of membrane proteins to the contact point with APC and prevented a “concentrated” morphology of accumulated MHC at the T cell-APC interface (27). Ab blocking of CD80 and CD86 also reduces the number of T cell-APC conjugates exhibiting CD3ζ “central capping” (28). To examine the redistribution of MHC:peptide complexes in the early stages of immunological synapse formation and to assess the role of costimulation in this process, we have generated a cellular reagent that permits us to specifically follow MHC molecules loaded with antigenic peptide. Fibroblasts were transfected with a plasmid encoding the I-Ek β-chain with enhanced green fluorescent protein (GFP) fused to the cytoplasmic tail and an antigenic peptide covalently tethered by a flexible peptide linker to the N terminus, allowing the peptide to load efficiently into the peptide-binding groove (29, 30). With this system, we can follow the movement of specific MHC:peptide complexes upon T cell-APC interaction by video microscopy. Because all specific moth cytochrome c peptide (MCC)-loaded MHC molecules and only MCC-loaded MHC molecules are GFP labeled in our system, we can track peptide-specific accumulation of MHC molecules in the T cell-APC contact zone with a much better signal-to-background ratio than has been possible in the pioneering video microscopy studies of Wülfing, Davis, and colleagues (27, 31) using APC transfected with I-Ek:GFP, only a minority of which could be loaded with MCC by incubation with exogenous peptide. Using this system, we have observed that Ag recognition, as indicated by a spike in intracellular Ca2+ concentration, occurs very early, preceding the earliest visible accumulation of MHC:peptide molecules as small spots in the contact zone. We also demonstrate for the first time that T cells appear to drag the immunological synapse with them as they move across an APC. Finally, our results show that blocking costimulation through LFA-1 or CD28 alters synapse morphology and significantly reduces both the area and amount of accumulation of specific MHC:peptide complexes in the mature immunological synapse. The reductions in size and intensity correlate with significant reductions in T cell proliferation, suggesting that the differences in synapses seen after 30 min of T cell-APC interaction are relevant to the long-term responses of T cells to Ag. Heterozygous AD10 TCR transgenic mice, specific for pigeon cytochrome c fragment 88–104 (32) and reactive against MCC fragment 88–103 on a B10.BR (H-2k) background, were kindly provided by S. Hedrick (University of California at San Diego, La Jolla, CA) by way of P. Marrack (National Jewish Medical Center, Denver, CO). Homozygous 3.L2 TCR transgenic mice, specific for peptide 64–76 of murine hemoglobin d allele (Hb), were kindly provided by P. Allen (Washington University, St. Louis, MO) (33). The mice were bred and maintained in specific-pathogen free conditions in the Oregon Health Sciences University animal care facility. AD10 TCR transgenic mice were identified by PCR and flow cytometry. The following conjugated or unconjugated Abs were purchased from BD PharMingen (San Diego, CA): anti-I-Ek (17-3-3), anti-CD80 (16-10A1), anti-CD86 (GL1), anti-ICAM-1 (3E2), anti-CD69 (H1.2F3), anti-Vβ3 (KJ25), anti-Vβ8.3 (1B3.3), anti-CD25 (3C7), anti-Vα11 (RR8-1), and streptavidin Cy-Chrome. Anti-nPKCθ (C18-G) was purchased from Santa Cruz Biotechnology (Santa Cruz, CA). Anti-phosphotyrosine (4G10) was purchased from Upstate Biotechnology (Lake Placid, NY). An anti-mouse IgG-PE secondary Ab was purchased from Southern Biotechnology Associates (Birmingham, AL), and a Texas Red-conjugated donkey anti-goat IgG was purchased from Jackson ImmunoResearch Laboratories (West Grove, PA). A fusion protein of murine CTLA-4 and human IgG H chain (CTLA-4Ig) was purified from supernatants produced by transfected cells kindly provided by P. Lane (University of Birmingham, Birmingham, U.K.) (34). Ltk− fibroblasts obtained from the American Type Culture Collection (Manassas, VA) displayed a broad range of endogenous CD80 expression. To generate CD80high fibroblasts for use in transfections, Ltk− cells were stained with anti-CD80 FITC and brightly stained cells were sorted on a FACSCalibur (BD Biosciences, Mountain View, CA). Sorted cells were cloned at limiting dilution, and the resulting clones were analyzed by flow cytometry. A high CD80-expressing clone (Ltk−CD80high) with levels similar to B10.BR splenocytes was used as the parental cell in transfections. Cells were maintained in DMEM (Life Technologies, Bethesda, MD) containing 10% FBS (HyClone Laboratories, Logan, UT) and supplemented with 1 mM l-glutamine, 100 mg/ml sodium pyruvate, 50 μM 2-ME, essential and nonessential amino acids (Life Technologies), 100 U/ml penicillin G, 100 U/ml streptomycin, and 50 μg/ml gentamicin (complete DMEM). To generate the GFP-tagged I-Ek β-chain with covalent antigenic peptide, a c-myc epitope tag was ligated, in frame, 3′ of MCC:I-Ek β-chain (30) in the phβA-pr1-neo vector (35) creating an MCC:I-Ek:c-myc chimera. The GFP fragment from the Clontech EGFP-N3 (Clontech Laboratories, Palo Alto, CA) plasmid was cut out and ligated, in frame, into the MCC:I-Ek β:c-myc plasmid to generate the MCC:I-Ek:GFP construct used in this study. Ltk−CD80high cells were transfected with 2 μg of the MCC:I-Ek:GFP construct, 30 μg of I-Ek α-chain in the pEVX-3 plasmid (kindly provided by R. Germain (National Institute of Allergy and Infectious Disease, Bethesda, MD)) (36), and 2 μg of ICAM-1 in the phβA-pr-1-neo plasmid, obtained from Dr. A. Brian (University of California at San Diego) (21), using Lipofectin (Life Technologies, Bethesda, MD) according to manufacturer’s directions. Transfectants were selected with 500 μg/ml G418 active drug, and resistant cells were screened for GFP expression and I-Ek surface expression by flow cytometry. Positive cells were FACS sorted based on GFP expression level, and cloned by limiting dilution. MCC clone A was chosen, because its GFP expression was the highest of the tested clones. The MCC clone A cells were supertransfected with 2 μg of wild-type I-Ek cDNA in pcDNA3.1(-) Hygro (Invitrogen, Carlsbad, CA) and 30 μg of I-Ek α-chain plasmid. After selection with 350 μg/ml hygromycin, surviving cells were analyzed by FACS for significant increases of I-Ek expression compared with the MCC clone A cells. Positive populations were FACS sorted and cloned by limiting dilution. One clone (MCC:GFP) was selected, because it expressed the highest level of wild-type I-Ek with minimal change in GFP expression. Single-cell suspensions of splenocytes from 6- to 12-wk-old AD10 or 3.L2 TCR transgenic mice were depleted of erythrocytes by hypotonic lysis and resuspended in RPMI 1640 (Life Technologies, Bethesda, MD) containing supplements as described for complete DMEM (complete RPMI). Cells were primed in vitro with 2.5 μM peptide (pigeon cytochrome c88–104 for AD10 and Hb for 3.L2) for 6 days without addition of exogenous IL-2. Lymphocytes were isolated from primed cultures by density centrifugation using Lympholyte M (Cedarlane, Hornby, Ontario, Canada) with a resulting purity of CD4+ cells >75%. T cells were resuspended at 5 × 106/ml in phenol red- and bicarbonate-free complete RPMI for use in microscopy. To monitor intracellular Ca2+ levels, T cells were resuspended at 2 × 106/ml in PBS containing 10% FBS, 1 mM CaCl2, and 0.5 mM MgCl2, and incubated with 1 μM fura 2-acetoxymethyl ester (Molecular Probes, Eugene, OR) for 30 min at 37°C in the dark. After washing in PBS, cells were resuspended at 107/ml in PBS containing 1 mM CaCl2 and 0.5 mM Mg2+ and incubated at room temperature in the dark for 15 min to allow for further dye hydrolysis. Cells were then stored on ice until use. Proliferation of the AD10 T cells in response to MCC:GFP cells was measured by a standard 72-h [3H]thymidine incorporation assay. Naive AD10 T cells were purified using T Cellect columns (Cytovax, Edmonton, Alberta, Canada). For APC titration experiments, 2.5 × 104 responders were cocultured with increasing numbers of irradiated (3000-rad) MCC:GFP cells and pulsed with 1 μCi of [3H]thymidine (2 Ci/mmol specific activity) during the last 12 h of a 72-h assay. In costimulation blocking experiments, 104 MCC:GFP cells were preincubated with blocking reagents for 1 h before the addition of 2.5 × 104 primed AD10 T cells. The proliferative response of 3.L2 T cells to the MCC:GFP cells was measured similarly. For maximal loading of Hb, MCC:GFP cells were treated for 20 min in 100 mM citrate buffer (pH 5.3) in PBS to strip weakly binding peptides from the wild-type I-Ek. Acid stripping does not alter the response of the AD10 T cells to MCC:GFP cells or allow MCC clone A cells to present Hb, indicating that this treatment does not displace the covalent MCC. These cells were then exogenously loaded with 20 μM Hb by overnight incubation. T cells (2.5 × 106) and MCC:GFP cells (2.5 × 105) were incubated overnight (12–16 h) in 2-ml total volume. Cells were stained for the activation markers CD25 and CD69, along with anti-Vβ Abs (anti-Vβ3 for AD10 and anti-Vβ8.3 for 3.L2) to measure TCR down-modulation. For live-cell microscopy, 2.5 × 105 APC were seeded into 0.17-mm Delta T culture dishes (Bioptechs, Butler, PA) 1 day before the experiment in 1 ml of complete DMEM. In the 3.L2 experiments, the MCC:GFP cells were acid stripped and loaded with 20 μM Hb as described above. Blocking reagents were added to the APC 1 h before imaging. Just before microscopy, DMEM culture medium was removed from the plate and replaced with 500 μl of complete RPMI culture medium free of phenol red and bicarbonate. Dishes were fitted into a Bioptechs ΔTC3 heated stage adapter and maintained at 37°C for the duration of the imaging. After adding 2.5 × 105 AD10 T cells to the dish, alternating 400 or 600× green fluorescent (528 nm) and differential interference contrast (DIC) images were taken every 8–12 s for 45 min with the Applied Precision Instruments (API) DeltaVision image restoration system (Issaquah, WA). This includes the API chassis with precision-motorized XYZ stage, a Nikon TE200 inverted fluorescent microscope with standard filter sets, halogen illumination with API light homogenizer, a CH350L camera (500 kHz, 12 bit, 2 megapixel, liquid cooled), and DeltaVision software. For fura 2 analysis, 600× images with excitation at 340 nm and 380-nm images were captured in addition to DIC and green fluorescence images. For analysis of fixed conjugates, 5 × 104 APC were placed into a LabTek II (Campbell, CA) eight-chambered 0.15-mm cover glass. After overnight incubation at 37°C, blocking reagents were added to the APC 1 h before addition of T cells. In vitro-primed AD10 T cells (2.5 × 105) were added to the wells, and the chambers were centrifuged for 30 s followed by a 30-min incubation at 37°C. Medium was removed, and the conjugates were fixed for 30 min at room temperature with 4% paraformaldehyde containing 0.5% glutaraldehyde in PBS. For intracellular staining, cells were permeabilized with 1% Triton X-100 in PBS after fixation. After blocking for 24 h with 1% BSA/0.1% NaN3 in PBS, cells were stained with the indicated primary Abs at 10 μg/ml in blocking buffer for 2 h at room temperature in a humidified chamber. Following four additional PBS washes, cells were incubated with secondary Abs at 5 μg/ml for 2 h at room temperature. After three more PBS washes, SlowFade Light antifade reagent (Molecular Probes) was added to the wells. Conjugates to be imaged were chosen based solely upon morphology in the DIC image. A stack of 50–90 fluorescent images spaced 0.2 μm apart in the z-axis was obtained at 600× or 1000× on the DeltaVision system and deconvolved using an iterative, constrained algorithm. Deconvolution, three-dimensional reconstructions, and measurements of synapse area and fluorescence intensity within the synapse were performed on an SGI Octane workstation (Applied Biosystems, Foster City, CA) using the API SoftWorx software package. After background subtraction, the integrated intensity, an indication of the amount of accumulated MHC within the synapse, was summed for areas with GFP intensity at twice background or greater. Potential alterations in GFP distribution at the synapse between treatment groups were identified by a blinded observer. Determination of statistical significance was performed with Student’s t test. 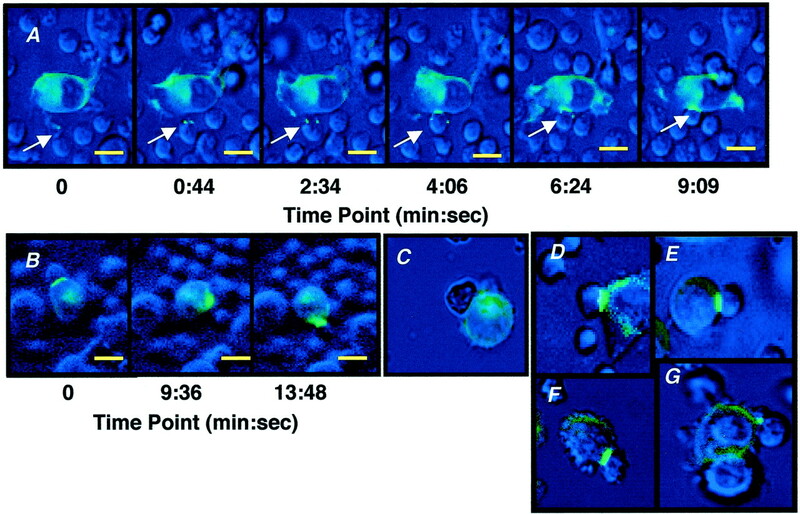 The on-line version of this article includes QuickTime movies of live-cell interactions (corresponding to Figs. 3⇓, A–C, and 4) and three-dimensional interfaces (corresponding to Figs. 2⇓, D and J, and 5, D, H, L, and P). A CD80high subclone of Ltk− fibroblasts was cotransfected with a construct encoding MCC fused via a linker to I-Ek β-chain and GFP (Fig. 1⇓A), I-Ek α-chain, and ICAM-1 plasmids by lipofection. The resulting MCC clone A had a 7.7-fold increase in GFP fluorescence above autofluorescence background (Fig. 1⇓C), I-Ek staining 17.6-fold above the nonspecific staining of the I-Ek-negative parental cells (Fig. 1⇓B), and induced proliferation of MCC-specific AD10 TCR transgenic T cells (data not shown). However, the only I-Ek on these cells contained the covalently attached MCC88–103. To better mimic physiological conditions in which specific MHC:peptide ligands are found in a sea of noncognate ligands, MCC clone A cells were supertransfected with plasmids encoding wild-type I-Ek β-chain and additional I-Ek α-chain. One of the resulting clones, MCC:GFP, expressed 2-fold more I-Ek than the MCC clone A cells, with levels similar to B10.BR splenocytes (Fig. 1⇓B). These cells express slightly elevated levels of GFP compared with MCC clone A, perhaps a function of additional I-Ek α-chain (Fig. 1⇓C). Because the increase in I-Ek staining is greater than the increase in GFP levels, we deduced that the wild-type I-Ek β-chain was expressed. 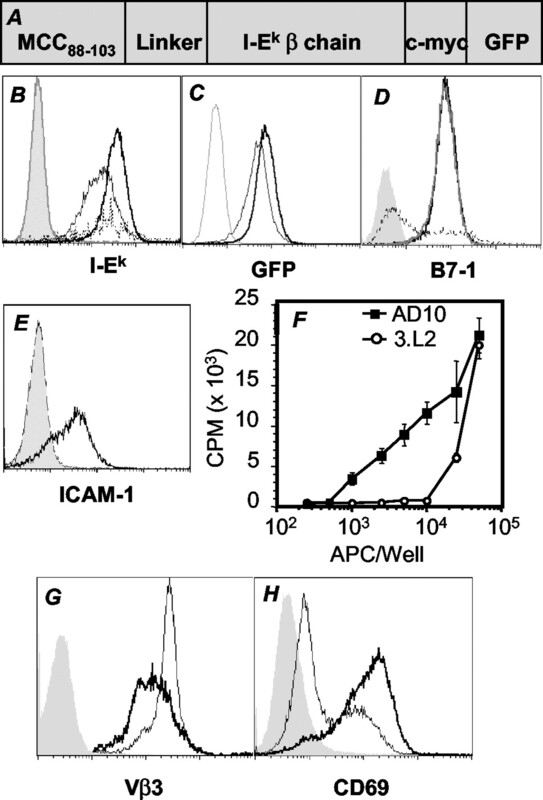 The MCC:GFP cells express intermediate levels of ICAM-1 (Fig. 1⇓E) and high levels of CD80 (Fig. 1⇓D) but remain CD86 negative (data not shown). Surface phenotype and functional characterization of transfected fibroblast APC. A, Schematic of the MCC:I-Ek:GFP construct used to transfect fibroblasts. B, I-Ek expression on CD80highLtk− (gray line) compared with MCC clone A (thin line) cells. To better mimic physiologic conditions, MCC clone A cells were supertransfected with wild-type I-Ek-generating MCC:GFP cells (bold line). I-Ek expression on B10.BR splenocytes (dotted line) is shown for comparison. The isotype control is shaded. C, Expression of GFP by MCC clone A (thin line) and MCC:GFP (bold line) cells compared with CD80high Ltk− (gray line) parental cells. D, CD80 expression on parental Ltk− (dotted line), CD80highLtk− clone (gray line), and MCC:GFP (bold line) cells. The isotype control is shaded. E, ICAM-1 expression on MCC:GFP (bold line) compared with CD80high Ltk− (gray line). The isotype control is shaded. F, Proliferative response of MCC-specific T cells to MCC:GFP cells (▪) and Hb-specific T cells to 20 μM Hb-pulsed MCC:GFP cells (○) as measured in a 72-h [3H]thymidine incorporation assay. G, TCR down-modulation on MCC-specific T cells after 16-h incubation with MCC:GFP cells. Unstimulated (thin line) and stimulated (bold line) are compared. Isotype control is shaded. H, CD69 expression on MCC-specific T cell blasts after 16-h incubation with (bold line) or without (thin line) MCC:GFP cells. The isotype control is shaded. When the ability of the MCC:GFP cells to stimulate MCC-specific AD10 TCR transgenic T cells was tested, we observed T cell proliferation in a dose-dependent manner (Fig. 1⇑F). Overnight incubation of the AD10 T cells with the MCC:GFP cells resulted in TCR down-modulation (Fig. 1⇑G) and up-regulation of CD69 (Fig. 1⇑H), both hallmarks of Ag recognition. MCC:GFP cells express unlabeled, wild-type I-Ek on their surface (Fig. 1⇑C). To assess the ability of the wild-type I-Ek to present Ag, MCC:GFP cells were acid stripped then exogenously loaded with 20 μM Hb. There is a dose-dependent increase in the proliferative response of Hb-specific 3.L2 TCR transgenic T cells to the peptide-pulsed MCC:GFP cells, indicating that the wild-type I-Ek is functional (Fig. 1⇑F). These studies clearly show that in addition to expressing functional levels of the MCC:I-Ek:GFP, MCC:GFP cells also express levels of wild-type I-Ek and ICAM-1 and CD80 sufficient for efficient T cell stimulation. Having established that the MCC:GFP cells induce full activation of AD10 T cells, we examined T cell-APC conjugates for the formation of immunological synapses. In vitro-activated AD10 T cells were incubated with MCC:GFP cells for 30 min before fixation and staining. Fig. 2⇓ illustrates an MCC:GFP cell interacting with two T cells. When T cells formed conjugates with the MCC:GFP cells, MCC:I-Ek:GFP molecules redistributed to the interface (Fig. 2⇓A). In addition, PKCθ (Fig. 2⇓B) and phosphotyrosine (Fig. 2⇓C) levels dramatically increased at the interface with the APC. The PKCθ and MCC:I-Ek:GFP colocalize at the interface with both T cells (Fig. 2⇓E) as do phosphotyrosine and MCC:I-Ek:GFP (Fig. 2⇓F). After three-dimensional reconstruction and rotation for an en face view (Fig. 2⇓, G–L), we found small nonoverlapping areas of single staining and a larger central region in which MHC:peptide, PKCθ, and phosphotyrosine were accumulated together (Fig. 2⇓J). In other experiments, we found that the central region of MCC:I-Ek:GFP accumulation was usually surrounded by a ring of ICAM-1 (data not shown). The colocalization of MHC:peptide with PKCθ in a central region, along with the peripheral ring of ICAM-1, are characteristic features of a mature immunological synapse. Thus, the interactions of the MCC:GFP cells with AD10 T cells result in formation of immunological synapses. In vitro-activated MCC-specific T cells form mature immunological synapses upon interaction with MCC:GFP cells. T cells were incubated with MCC:GFP cells for 30 min before fixation and staining. Conjugates were stained with Abs against PKCθ (shown in red: B, E, H, and K) and phosphotyrosine (shown in blue: C, F, I, and L). MCC:I-Ek:GFP is shown in green (A, D, G, and J). A–F, Images of an APC and two attached T cells are shown: GFP only (A), PKCθ only (B), phosphotyrosine only (C), all three (D), GFP plus PKCθ (E), GFP plus phosphotyrosine (F). Both PKCθ and phosphotyrosine appear to colocalize with the GFP at both T cell-APC interfaces. G–L, A three-dimensional reconstruction of the T cell-APC interface from the upper right T cell in A–F was rotated 90° to generate a view of the interface from the T cell perspective. The arrangement of individual panels is as described for A–F. A central, dense accumulation of MHC colocalizes with PKCθ (K and J) and phosphotyrosine (L and J). Bar, 10 μm. When the two separate T cell-APC interfaces in Fig. 2⇑ are compared, it is apparent that the T cell on the upper right side of the APC has formed a mature, compact immunological synapse (Fig. 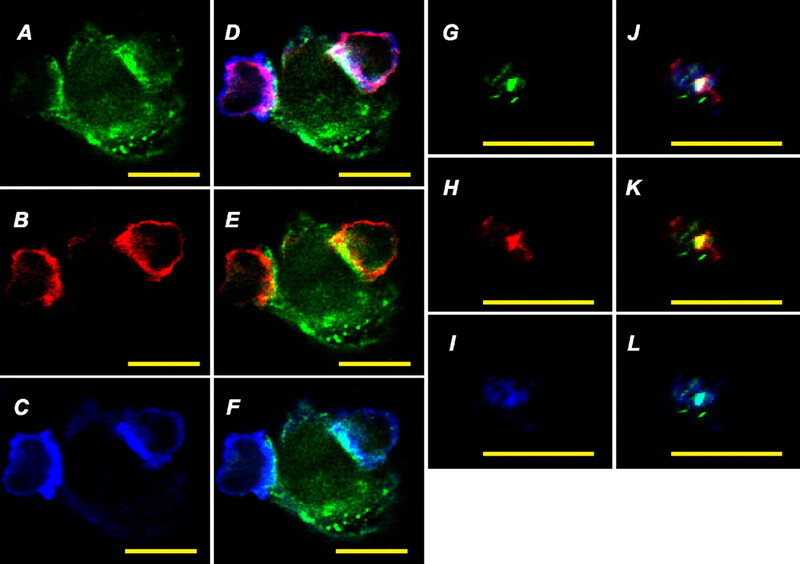 2⇑ and Movie 2D in the on-line supplemental material), whereas the T cell on the left has not: both MHC and PKCθ have accumulated, but they extend across the interface, and colocalization with each other, and with phosphotyrosine, is reduced (Fig. 2⇑, A–F, and Movie 2D in the on-line supplemental material). This difference in morphology of the T cell-APC interface, together with the lack of a final mature immunological synapse structure, suggests that this T cell was caught earlier in the process of synapse formation. The higher level of phosphotyrosine at the left interface compared with the other is consistent with the higher levels of phosphotyrosine detected before mature synapse formation by biochemical and microscopic methods (37). We went on to examine the dynamics of the interactions between live T cells and live APC during the process of immunological synapse formation. To assess redistribution of the GFP-tagged MHC:peptide complexes and monitor the morphology of T cell-APC interactions, we obtained alternating fluorescent and DIC images. The interaction of in vitro-primed AD10 T cells with the MCC:GFP cells resulted in redistribution of GFP-tagged MHC molecules to the interface that ultimately coalesced to form a stable, compact structure with significantly increased MHC density (Fig. 3⇓A) similar to that observed with the fixed conjugates (Fig. 2⇑, A and G). Thus, in our live-cell imaging, the formation of a “mature” immunological synapse was defined as a GFP cluster at the interface of a T cell and APC that has reached maximal size and fluorescence intensity. The formation of the immunological synapse is a complex, dynamic process driven by the T cell actin cytoskeleton. MCC-specific T cells, activated in vitro for 6 days with peptide, were added to plates containing MCC:GFP fibroblasts. To follow T cell-APC interactions and synapse formation, alternating GFP and DIC images were captured with an image-capture frequency of 12 s. Images are an overlay of a GFP image (in green) with a DIC image (pseudocolored blue). A, Small MHC clusters appear at the T cell-APC interface, intensify, and ultimately coalesce to form a mature immunological synapse. B, When T cells reinitiate locomotion across the surface of an APC, the immunological synapse moves concomitantly. In 13 min, the synapse has moved a total of 24 μm. C, When MCC:GFP cells are pulsed with Hb, the Hb-specific T cells recognize Ag and form stable conjugates morphologically identical with those of MCC-specific T cells, but no redistribution of MCC:I-Ek:GFP is observed. D–G, Synapse formation involves actin cytoskeleton rearrangement within T cells. When compared with the control (D), treatment of T cells with 20 μM cytochalasin D (G) alters synapse size, intensity, and morphology while 20 μM colchicine treatment of T cells (F) does not significantly alter synapse formation. Cytochalasin D (20 μM) treatment of APC (E) has no effect on synapse formation. The images were obtained at ×400. The interactions of a T cell and an APC leading to the formation of an immunological synapse are complex and dynamic. After analysis of >500 interactions, a consistent pattern emerged. Generally, T cell migration ceased upon initial T cell-APC contact, which frequently (>50% of interactions) occurred on a membrane projection from the APC. This was followed by distinct morphological changes of the T cell that resulted in tight adherence and flattening against the APC, with a dramatic increase in the contact area. Within ∼0.5–1 min of the first contact and concomitant with the morphological changes of the T cell, small spots with increased GFP fluorescence became visible at several locations along the T cell-APC interface (Fig. 3⇑A). Our data suggest that these spots contain only specific MHC:peptide complexes, because no accumulation of GFP at the T cell-APC interface was observed when Hb-specific T cells interacted with Hb-pulsed MCC:GFP cells (Fig. 3⇑C). During this initial phase, movement of these GFP spots was not uniform. Most spots migrated directly to the interface, but others appeared to move away from the interface to the “backside” of the T cell, reminiscent of the movements of CD43 (38, 39) and a subpopulation of TCR (11) seen in other studies. These spots ultimately moved toward the T cell-APC interface and coalesced into a very bright mature synapse (Fig. 3⇑A and Movie 3A in the on-line supplemental material). On average, this process took 5.5 min from first contact to mature synapse formation (range, 3–20 min). In ∼25% of the conjugates, movement of the T cell across the APC resumed after synapse formation. Similar movements following conjugate formation have been previously described (40, 41), but these studies did not examine the fate of the immunological synapse. We observed that, whenever T cells migrated across the surface of the APC, the synapse moved along with them. In Fig. 3⇑B (Movie 3B in the on-line supplemental material), a mature synapse formed ∼5 min after the initial T cell-APC interaction. At that point, the T cell reinitiated locomotion across the APC and the synapse moved along with the T cell, in this case >24 μm over a 14-min period. When T cells dissociate from the APC in live-cell imaging, MCC:I-Ek:GFP molecules frequently are transferred from the synapse to the T cell (S. A. Wetzel, unpublished results). To determine whether synapse formation in this system is dependent upon actin-cytoskeleton rearrangements, as previously described (10, 42), T cells or APC were pretreated with cytochalasin D to block actin polymerization. When APC were pretreated, a normal synapse formed (Fig. 3⇑E), but when actin rearrangements were blocked in the T cell, small, stable spots appeared that never accumulated more MHC or coalesced (Fig. 3⇑G). Colchicine treatment of the T cells to inhibit microtubule function had no detectable effect on synapse formation (Fig. 3⇑F). Thus, although the formation of the small synapse precursor clusters appears to be independent of the cytoskeleton, aggregation of these clusters to form a mature immunological synapse is driven by rearrangements of the T cell actin cytoskeleton. The microtubule network within the T cell and the actin cytoskeleton within the APC are not necessary for synapse formation in this system. To assess the relationship between the initiation of intracellular signaling and synapse formation, AD10 T cells were loaded with the ratiometric Ca2+-indicator fura 2 and added to plates containing MCC:GFP cells. The image series in Fig. 4⇓ (from Movie 4 in the on-line supplemental material) is representative of images collected in seven separate experiments (>100 conjugates). In this series, three individual T cells interact with a single APC. Within 18 s of initial contact with the APC, there is a large increase in intracellular Ca2+ in the first T cell (Fig. 4⇓, cell 1). Within 30 s of the Ca2+ flux (∼0.5 to 1 min after initial contact), the first small MHC clusters become visible. By 1 min and 59 s, the T cell had flattened against the APC, increasing the contact area between the cells, and a large cluster of MHC was visible at the interface. A mature synapse was formed by 7 min and 40 s and was maintained for the duration of imaging. Intracellular Ca2+ increased within 10 s of the second T cell making contact with the APC (Fig. 4⇑, cell 2). At this time point, a small MHC cluster was visible at the point of contact between the T cell and the APC. Over the next 2 min, several smaller spots merged and the cluster intensified significantly. By 5.5 min after initial contact, a mature synapse was present at the interface of this T cell and the APC. These data show that the initial visible MHC redistribution occurs at the same time, or shortly after, the intracellular Ca2+ concentration increases. Mature synapse formation follows 3–20 min later. When a rise in intracellular calcium was blocked by pretreatment of the T cells with the Ca2+ chelator 1,2-bis(2-aminophenoxy)ethane-N,N,N′,N′-tetraacetic acid, no MHC redistribution was seen, and no mature synapses formed (data not shown). Thus, the increase in intracellular Ca2+ occurs before the initial redistribution of MHC and mature synapse formation, and the Ca2+ flux is required for this process, as shown previously in other systems (7, 27). Having examined the dynamics of synapse formation, we turned to assessing the role of CD80 and ICAM-1 in this process. APC were pretreated for 1 h with 25 μg/ml CTLA-4Ig (34) to block CD80 and CD28 interactions. Similarly, 25 μg/ml of anti-ICAM-1 was used to block productive engagement of LFA-1 and ICAM-1. As a control, another set of cells were preincubated with 25 μg/ml of anti-I-Ek to block Ag recognition. With CTLA-4Ig blockade of CD80/CD28 interactions, the mean time between initial T cell-APC contact and mature synapse formation increased modestly but significantly (p = 0.04) from 5 min and 30 s (±16 s) to 7 min and 11 s (±41 s), an increase of 24%. Costimulation blockade also reduced the size and intensity of the synapses in live-cell images (data not shown) but did not prevent characteristic T cell morphologic changes (Fig. 5⇓, A, E, I, and M). However, because kinetic imaging is conducted only in one focal plane, movement of T cells in and out of that plane can alter the apparent size of a synapse. Effects of costimulation blockade on formation of the mature immunological synapse. Shown are representative pictures of MHC clustering within the immunological synapse after MCC:GFP cells were preincubated with 25 μg/ml human IgG (A–D), CTLA-4Ig (E–H), anti-ICAM-1 (I–L), or anti-I-Ek (M–P) for 1 h before addition of T cells. The left column (A, E, I, and M) contains DIC images; an arrow indicates the conjugate analyzed in the right three columns. 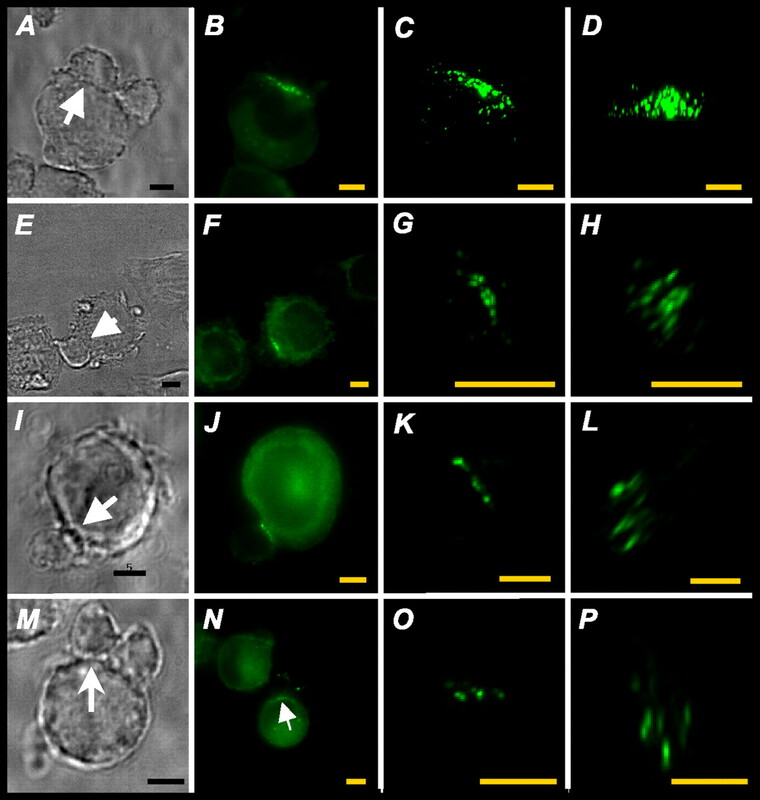 The second column (B, F, J, and N) shows GFP images of the same conjugates demonstrating the accumulation of MCC:I-Ek:GFP at the T cell-APC interface. The third and fourth columns show three-dimensional reconstructions of the interface after image deconvolution. The third column (C, G, K, and O) has the synapse oriented as in the second column for reference. The fourth column (D, H, L, and P) shows the interface rotated 90° generating a view of the interface from the T cell perspective. The MHC clusters are smaller and more diffuse after costimulation blockade. Contrast and brightness settings are identical in the right two columns. The images were collected at ×1000, but image processing has resulted in nonuniform magnifications of reconstructed interfaces in the various panels, so the magnifications are greater in the panels with costimulation blockade. Bar, 5 μm. To more accurately measure the area and GFP intensity in the synapse, T cells were incubated with the pretreated MCC:GFP cells for 30 min before fixation. The imaged conjugates were chosen based solely upon their characteristic flattened morphology in DIC (Fig. 5⇑, A, E, I, and M). A stack of images was taken 0.2 μm apart in the z-axis, deconvolved, and used to construct a three-dimensional representation of the interface. The three-dimensional interface was rotated 90° to show the interface from the T cell perspective. A representative set of interface images for each treatment is shown in Fig. 5⇑, D, H, L, and P (Movie 5, D, H, L, and P in the on-line supplemental material). After analysis of >150 conjugates, we observed that the morphology of the synapse was clearly altered when the APCs were preincubated with the blocking reagents. The synapses with control IgG (Fig. 5⇑D) generally had one or a few large, intense clusters surrounded by several smaller regions with increased density. By contrast, synapses were more diffuse, were irregular in shape, and lacked a dense central cluster when CD80 (Fig. 5⇑H) or ICAM-1 (Fig. 5⇑L) was blocked. They were also smaller and less intense than the control IgG synapses. (Note the 5-μm bar showing the changes in scale among the panels in Fig. 5⇑.) When APC were pretreated with anti-I-Ek to block TCR engagement, the patterns were similar to costimulation blockade (Fig. 5⇑P). The incomplete inhibition of Ag recognition and synapse formation seen with anti-I-Ek presumably reflects incomplete blockade of the MCC:I-Ek:GFP complexes owing to their high density on the APC. In addition to examining the morphology of these synapses, we quantified the area and intensity of the clustered MHC molecules in the synapse with fluorescence intensity at least 2-fold above background. The data in Fig. 6⇓, A and B, are representative of six separate experiments with similar results. Blockade of CD80/CD28 and ICAM-1/LFA-1 interactions significantly reduce the size and intensity of the synapse. A and B, Quantitation of the MHC clusters in the mature immunological synapses after costimulation blockade. Ag-specific conjugates were formed and imaged as described for Fig. 5⇑. Regions of MHC intensity greater than twice background were quantified in 90°-rotated images (similar to Fig. 5⇑, D, H, L, and P). A, The areas of all MHC clusters were summed for each cell. Mean values ± SEM for each treatment group are shown. B, The background subtracted integrated intensity of the MHC in clusters was summed. Mean values ± SEM for each treatment group are displayed. Integrated intensity values reflect the amount of MHC accumulated within the synapse. C, Costimulation blockade significantly reduces T cell proliferation. MCC:GFP cells were preincubated with 25 μg/ml indicated blocking reagents for 1 h before addition of primary (▪) or in vitro-primed T cells (□). Alternatively, 105 fresh B10.BR spleen cells were pulsed for 1 h with 50 nM MCC and then with costimulation blocking reagents for 1 h before addition of in vitro-primed T cells (▦). Values that are significantly reduced relative to IgG control are indicated (∗, p < 0.05; and ∗∗, p < 0.01). Data are representative of six separate experiments. Costimulation blockade significantly reduced the total area of clustered MHC in the synapse. Treatment with the control IgG resulted in a synapse with a mean area of 2.8 μm2 (Fig. 6⇑A). CTLA-4Ig treatment significantly reduced the size of the synapse, as did anti-ICAM-1 treatment. No additive or synergistic effect of CTLA-4Ig and anti-ICAM-1 was observed (data not shown), perhaps due to the relatively low ICAM-1 expression and/or the saturating concentration of the blocking reagents. Anti-I-Ek pretreatment to block TCR engagement reduces synapse area to a similar degree. Costimulation blockade also significantly reduced the integrated intensity of the GFP signal (Fig. 6⇑B) and thus the total amount of MHC:peptide at the synapse, because the integrated intensity is proportional to the amount of the MHC:peptide in the synapse. Precoating the APC with 25 μg/ml anti-transferrin receptor Ab did not affect any of the observed features of synapse formation (data not shown), discounting the possibility that the effect of the blocking reagents was simply due to steric interference with the cellular interactions. Having established that costimulation blockade significantly altered immunological synapse size, intensity, and morphology, we assessed the effects of these conditions on T cell proliferation. CTLA-4Ig blockade of CD80/CD28 engagement significantly reduced the proliferation of AD10 T cells under all conditions tested (Fig. 6⇑C). Blockade of ICAM-1/LFA-1 interactions also significantly reduced proliferation, although not quite as effectively as CTLA-4Ig. The effects of anti-I-Ek were similar to those of CTLA-4Ig. Therefore, costimulation blockade conditions identical with those used in microscopy experiments result in significant reductions in T cell proliferation. Interestingly, although the blockade of CD80 or ICAM-1 significantly reduced T cell proliferation as well as the size and intensity of the synapse, it had no effect on TCR down-modulation (Fig. 7⇓A) or CD69 (Fig. 7⇓B) or CD25 expression (Fig. 7⇓C). Costimulation blockade under these conditions does not affect other parameters of T cell activation. MCC:GFP cells were preincubated with 25 μg/ml control Ig, CTLA-4Ig, anti-ICAM-1, or anti-Ek for 1 h before addition of in vitro-primed T cells. After 16 h of incubation, cells were stained with Abs to Vβ3 (A), CD69 (B), or CD25 (C). Histograms are gated on CD4-positive lymphocytes. The unstimulated control histogram is shaded. All the stimulated histograms are overlapping, except that CTLA-4Ig slightly inhibits CD69 expression in B in this experiment. Using fibroblasts transfected with GFP-tagged MHC class II containing a covalently attached antigenic peptide (MCC) as APC, we observed for the first time specific peptide:MHC ligands on living APC during T cell-Ag recognition. Using these APC, we have systematically examined the formation of the immunological synapse and the role of costimulation in this process. T cell cytoplasmic Ca2+ spikes within 10–30 s of T cell-APC contact (Fig. 4⇑), consistent with previously published reports (42). The Ca2+ flux precedes or coincides with the first detectable early small clusters of peptide:MHC at points of cell contact. It requires Ag recognition, because Hb-specific T cells do not flux Ca2+ when they encounter APC without Hb (data not shown). An increase in Ca2+ also precedes morphological changes of the T cell characterized by a flattening of the T cell against the APC, increasing the area of contact. This change in T cell morphology upon Ag recognition has been described previously (7, 42, 43, 44) and appears to require Ca2+ flux, although the Ca2+ increase alone is not sufficient to induce changes in shape (43). Within 1 min of contact, small regions of increased MCC:I-Ek:GFP density become visible at or near the point of contact between the cells (Fig. 3⇑A). The observation of small early MHC clusters agrees with previous reports using planar lipid bilayers (7, 11) and is consistent with the report of Krummel et al. (28) of the formation of small CD3ζ clusters within seconds of initial T cell-APC interactions. We believe that these spots comprise TCR bound to specific MHC:peptide ligands, because no spots were observed when Hb-specific T cells recognized Hb loaded into unlabeled I-Ek molecules on the same APC (see below). These MHC spots rapidly increase in intensity indicating the accumulation of TCR-MHC:peptide complexes. Initially some of these small clusters accumulate at the interface while others move away from the interface toward the opposite pole of the T cell. Similar movements have been shown for the TCR (11) along with molecules excluded from the synapse such as CD43 (38, 39). It is unknown why some MHC:peptide complexes move toward what Sperling and colleagues (39) have termed the “antipode” in the initial phases of immunological synapse formation, but it is most likely associated with the polarization of the T cell cytoskeleton. The timing of the appearance of small MHC clusters shown here correlates with the timing of maximal tyrosine phosphorylation and Ca2+ increases within T cells (37, 42, 45). Over a period of 5.5 min on average, the small clusters coalesce to create a larger, stable, more intense structure that colocalizes with PKCθ (Fig. 2⇑) and is surrounded by an ICAM-1 ring (data not shown), a mature immunological synapse. Aggregation of peptide:MHC at all stages of synapse formation appears to be peptide-specific and so must be driven by the peptide-specific TCR on the T cell. The MCC:GFP cells expressed both MCC:I-Ek loaded with covalently attached MCC and unlabeled I-Ek molecules that could be loaded with exogenous Hb (Fig. 1⇑). Hb-specific T cells recognize and respond to Hb-pulsed MCC:GFP cells (Fig. 1⇑), but we have observed no early GFP spots (data not shown) and no accumulation of GFP above background in stable conjugates with Hb-specific T cells (Fig. 3⇑C), implying that the Hb-specific T cells do not cause accumulation of MCC-loaded I-Ek molecules. This finding is seemingly at odds with the recent report by Wülfing et al. (27), who demonstrated accumulation of I-Ek molecules loaded with a null peptide in synapses on supported planar bilayers, and inferred an accumulation of endogenous peptide:MHC complexes in synapses with transformed B cells. However, they observed accumulation of null or endogenous peptide:MHC complexes primarily in “unstable” and “diffuse” patterns, and only when concentrations of agonist peptide were limiting. We used high concentrations of agonist Hb in these experiments, with limiting Hb, we have been unable to detect sufficient numbers of conjugates to examine GFP accumulation in our system. Although it is clear from our video images that the small MHC clusters are precursors of the immunological synapse, it is not clear what drives their formation. Their formation may be cytoskeleton independent, because similar spots form when T cells are treated with cytochalasin D (Fig. 3⇑G), although cytochalasin D treatment of T cells, but not of APC, blocks mature synapse formation (Fig. 3⇑, E and G). Small cluster formation may reflect an intrinsic property of TCR-MHC:peptide complexes to form oligomers when engaged on opposing plasma membranes (46) and may be an essential event in TCR signaling (47, 48, 49, 50). In addition to TCR ligation of cognate MHC:peptide complexes, costimulation is required for full T cell activation. Although CD80 and CD28 are localized to the c-SMAC region of the immunological synapse, the role of these molecules in the formation of the synapse is still debated. Several reports from Davis and colleagues (9, 27, 28) have suggested that costimulation through CD28 is a necessary component of the molecular rearrangements that lead to the immunological synapse. Additionally, Huang et al. (51) recently showed that while PKCθ and LFA-1 accumulate at the interface of APC and CD28-deficient T cells, these molecules are not segregated into prototypical p- and c-SMACs. Contradicting these findings, work primarily from Dustin and colleagues (7, 24) suggests that B7/CD28 interactions are not required for synapse formation with MHC and ICAM-1 incorporated into planar lipid bilayers. Similarly, in a recent report, Holdorf et al. (25) showed that CD28 facilitated sustained Lck activity, but was dispensable for synapse formation, because the frequency of conjugate formation and the recruitment of Lck to the synapse was not altered in CD28-deficient T cells. In agreement with that finding, CD28-deficient T cells show efficient polarization of the TCR and intracellular IL-2 toward the APC in vivo, suggesting normal synapse formation (26). Using our system, with which we can follow the movement of specific MHC:peptide ligands, we have confirmed that CD80/CD28 and ICAM-1/LFA-1 are mediators of mature synapse formation with living APC. To accurately quantify the synapses, we adapted the fixed conjugate methodology of Kupfer and colleagues (1, 2, 3, 4, 52). A reconstructed three-dimensional interface was generated from which we measured the intensity and area of clustered MHC. MHC clusters were defined as areas with a density of MHC at least twice background, which was only a small portion of the entire contact region between the APC and T cell. Monks et al. (4) have estimated that only ∼6% of the contact zone contains accumulated TCR. Upon quantitation of the area and amount of MHC accumulated in the synapses, we determined that blocking CD80 with CTLA-4Ig or ICAM-1 with anti-ICAM-1 Ab significantly reduces both the size (Fig. 6⇑C) and intensity (Fig. 6⇑B) of accumulated MHC. The morphology of the clustered MHC is also altered in the treated synapses (Fig. 5⇑). The synapses with control IgG (Fig. 5⇑D) generally have one or a few large, intense clusters surrounded by several smaller regions with increased density. This pattern is reminiscent of the MHC distribution in fixed AD10 T cell-B cell conjugates reported by Monks et al. (4). With costimulation blockade, no central dense cluster is observed and the MHC clusters formed are irregularly spaced. However, costimulation blockade does not completely block MHC redistribution to the contact region. The mechanisms by which CD80/CD28 and ICAM-1/LFA-1 interactions influence synapse formation are not completely understood. Previous reports, as well as the data presented in this study, point to the importance of the actin cytoskeletal rearrangements in immunological synapse formation (10, 42). Both CD80/CD28 and ICAM-1/LFA-1 interactions have been linked to cellular actin rearrangements (23, 53), and it is likely that costimulation functions, at least in part, to control actin dynamics within the T cell. Consistent with this notion, Vav1, an upstream control element in T cell actin dynamics, is hyperphosphorylated and activated upon CD28 ligation in the presence of a TCR signal (15, 54, 55). Vav1-deficient T cells, which have been compared phenotypically to normal T cells responding to Ag on costimulation-deficient APC (31), do not display TCR clustering in response to CD3 cross-linking (55), and form defective immunological synapses, in that MHC molecules do not accumulate within the c-SMAC (31). CD28 cross-linking also induces aggregation of lipid rafts on T cells (17), which are linked to the reorientation of actin (56). We found that the magnitude of the reduction of synapse size and intensity and the reductions in T cell proliferation are very similar. This indicates that the size and/or intensity and/or morphology of the immunological synapse present at 30 min may be predictive of full T cell activation. These results are in agreement with the models that propose that synapse formation may serve as a “checkpoint” for full T cell activation (5, 12, 24, 57). By contrast, in our experiments, costimulation blockade does not significantly affect TCR down-modulation (Fig. 7⇑B), CD25 expression (Fig. 7⇑C), or CD69 expression (Fig. 7⇑A). Our results are consistent with previous studies showing that B7/CD28 does not enhance TCR down-modulation, and ICAM-1 is important in TCR down-modulation only at low ligand density (58, 59). The lack of a correlation between TCR down-modulation and the size and morphology of the immunological synapse suggest that these two phenomena of T cell activation may be independent. In this report, we describe a cellular reagent that permits direct observation of specific MHC:peptide complexes on APC during T cell engagement. We have observed the initial stages of synapse formation and found that the earliest visible small peptide:MHC clusters form after TCR-initiated intracellular signaling. We found that synapses appear to be dragged across the surface of the APC when T cells resume movement after Ag recognition and synapse formation. Finally, we have determined that costimulation by CD80/CD28 and ICAM-1/LFA-1 mediates normal immunological synapse formation. The correlation between T cell proliferation and synapse size and appearance provides evidence for functional relevance of the immunological synapse in full T cell activation. We thank Aurelie Snyder and the Oregon Health Sciences University Molecular Microbiology and Immunology Microscopy Core Facility for expert technical assistance, Stan Barter for technical assistance with transfections, and Marcie Hackbarth for constructing the MCC:I-Ek:GFP plasmid. We also thank Drs. Dean Evans, Per Dullforce, Ann Hill, David Hinrichs, and Michael Davey for critical review of the manuscript and other colleagues for providing essential materials. ↵1 This work was supported by National Institutes of Health Grants AI29544 and AI50823 and a grant from the Oregon Health Sciences Foundation. S.A.W. was supported by Training Grant EYO7123 from the National Eye Institute. ↵3 Abbreviations used in this paper: SMAC, supramolecular activation complex; c-SMAC, central region SMAC; p-SMAC, peripheral ring SMAC; DIC, differential interference contrast microscopy; GFP, enhanced green fluorescent protein; MCC, moth cytochrome c peptide; Hb, murine hemoglobin peptide.